It may not currently be the Christmastime season, but movie buffs and holiday-film fans across the country will have a perfectly reasonable excuse to re-watch the yuletide classic "National Lampoon's Christmas Vacation" over the next month or so in anticipation of seeing in-person one of the most notable elements of the gut-busting 1989 comedy that chronicles the zany, uber-quotable adventures of the 'Griswold's' family Christmas. Much of the movie's enduring success is derived from the relatable, if not inevitable, follies of a large family gathering during the festive holiday season. And of course, no character is more beloved than the wacky-yet-lovable mooch, Cousin Eddie, played masterfully by actor Randy Quaid. Straight out of the "every-family's-got-one" department, the shameless and overbearing Cousin Eddie arrives to the Griswold's family gathering unannounced and in a hideous eyesore of an RV, with his wife, three kids and rottweiler "Snots" in tow, imposing on an already chaotic situation. As it turns out, the RV, a character in itself which causes Chevy Chase's character, Clark Griswold, almost more grief than he can handle, is an honest-to-goodness vehicle that still exists today. Currently it's in the loving possession of Atlanta-area resident Bob Boston, who will be bringing it to the 2018 Summit Racing Equipment Atlanta Motorama to put it on display and offer tours to interested fans on both days of the event, scheduled for next April 28 and 29. Boston, a fan of the movie since its release in 1989, purchased the four-wheeled monstrosity from a previous owner in the Phoenix, Arizona area on a whim 10 years ago at the behest of his wife. "My wife found it in Arizona with a guy - he had a bunch of Christmas ornaments. And she ran into it (while searching for Christmas décor), and she demanded that I buy it," explained Boston. Purchasing it sight-unseen, Boston retrieved it from nearly 2,000 miles away, and he and his wife immediately went to work "restoring" it to its silver-screen condition. "At that time, all the stuff on it in the movie was just paint," said Boston. "It was actually pretty nice. It was beige and gold. "But what we did is, when we got it back from across the country, after spending $1,800 between gasoline and breakdowns - it gets like four miles per gallon - is, my oldest son, he's an artist, so we took stills of each side of the vehicle from the movie, and we put it back into character, exactly like it was in the film. "What looks like mud is now paint and plasticine, and it ain't going anywhere anymore." 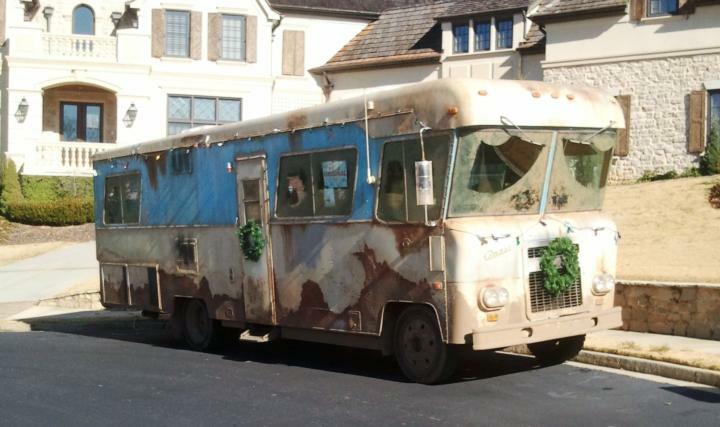 Going full "Cousin Eddie" while sparing no expense, the Bostons went all-out in re-creating the movie-version of the RV, including all the way down to the gritty details on the interior. "They never showed the inside of the thing in the movie," said Boston. "But my wife did up the inside like she though Cousin Eddie might have it. It's got the little Elvis plate and WWF wrestler calendars and crushed beer cans. Everything is hot-glued inside. In the bathroom, there are nasty-looking hairbrushes and burnt cigarette butts." And like most notable celebrities, the Boston's "Cousin Eddie" RV is often immediately recognized by fans of the movie when cruising Atlanta-area roads, though some drivers can be a little leery. "It's funny. About 20 percent, about a fifth of the people instantly recognize it, because they give you the thumbs-up," said Boston. "But the other ones - you pull up beside a lady in a minivan, and she is not making eye contact with you, no matter what. We have a lot of fun with it." Going on 10 years parked near their Atlanta-area home, Boston said the RV has become a bit of a neighborhood attraction. "What happens," said Boston, "is people start spouting off lines they remember from the movie. We have fun with it. It's become part of our subdivision. Our neighbors will say things like, 'When are you bringing Cousin Eddie? We're having a party; we want to make sure Cousin Eddie's here.'" Despite its celebrity status, Boston doesn't do many appearances with the RV, save for a couple of visits to Hallmark stores around the holidays to help promote their "National Lampoon's Christmas Vacation" tree ornament. So while a "Cousin Eddie RV" sighting may not be likely, even during the holidays, fans will be able to get a close-up look at the made-for-movie version of the infamous RV when the Atlanta Motorama, Georgia's motoring festival, returns to Atlanta Motor Speedway April 28-29.